The Artist network event presentation will begin at 6:00 pm with a reception to follow at 7pm. Registration by December 3, 2018 is required. CLICK HERE TO REGISTER! 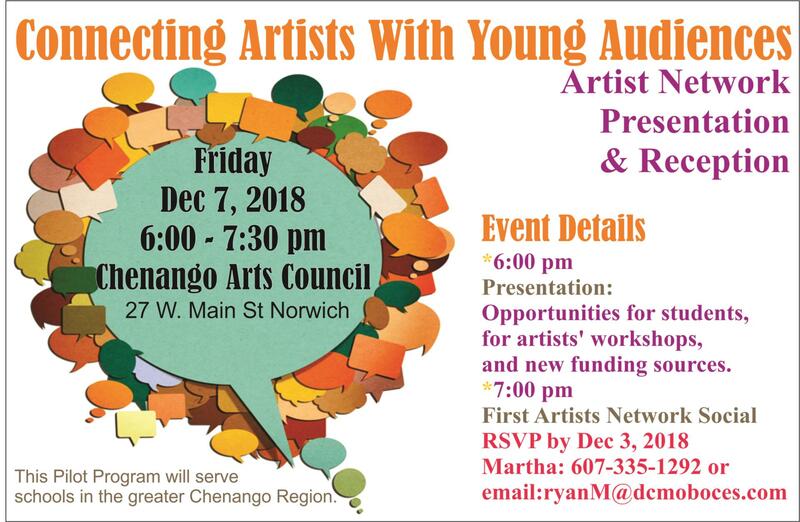 Connecting regional artists to young audiences will be the highlight at the first Regional Artists Network event to be held at the Chenango Arts Council on December 7, 2018. The collaborative efforts led by DCMO BOCES with the Chenango Arts Council strives to identify our local talent and connect them to the classroom. DCMO BOCES, as part of their vision to propel regional growth as a premier provider of educational services, is expanding the local arts network to introduce students to careers destinations connected to the arts.